President Donald Trump’s Supreme Court nominee, Neil Gorsuch, in the East Room of the White House in Washington on Tuesday. On Tuesday evening, in the East Room of the White House in prime time, President Trump tapped Neil Gorsuch as his nominee to the Supreme Court. The court has had a vacancy since the death of Justice Antonin Scalia nearly a year ago. Gorsuch is a judge on the 10th U.S. Circuit Court of Appeals, the Denver-based federal court that covers Colorado, Kansas, New Mexico, Oklahoma, Utah and Wyoming, as well as the portions of Yellowstone National Park that extend into Montana and Idaho. He was appointed to the position by George W. Bush in 2006 and was confirmed by the Senate in a voice vote. He attended Harvard Law School, as well as Columbia and Oxford, and clerked for Justices Byron White and Anthony Kennedy of the Supreme Court. (White retired in 1993 and died in 2002.) It’s the sort of gleaming ivory C.V. that was largely absent from the rest of Trump’s shortlist. Academically, Gorsuch would fit right in: Every current justice attended law school at either Harvard or Yale. But if he’s confirmed, it would be the first time a justice and his former clerk sat together on the Supreme Court. Gorsuch is 49. The youngest member of the current court, Justice Elena Kagan, is 56. Ideologically, Gorsuch would almost certainly represent a reliably conservative vote and voice, restoring the tenuous balance on the court that existed before Scalia’s death. 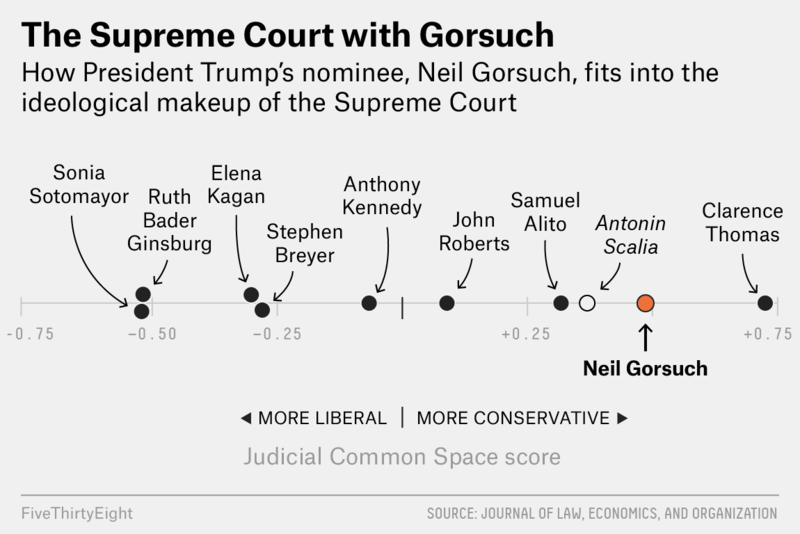 According to ”judicial common space” scores, developed by a team of political scientists and legal scholars, Gorsuch would be the most conservative justice save for the silent stalwart Justice Clarence Thomas and would sit somewhere just to the right of the ideological space occupied by Scalia. Trump promised to nominate justices “very much in the mold” of Scalia, and Gorsuch seems to fit the chair. A recent working paper by a group of attorneys and academics tried to gauge the “Scalia-ness” of several potential Trump nominees. Gorsuch did well in the lookalike contest. Like Scalia’s, his opinions were especially likely to invoke originalism — the idea that, rather than an evolving document, the meaning of the Constitution was fixed at its enactment. Beyond the statistics, Gorsuch’s judicial record ticks many conservative boxes. As SCOTUSblog explained, many of his high-profile cases have involved religion. He sided with Hobby Lobby, which viewed contraception as immoral, in a case related to the Affordable Care Act and has opposed limiting religious expression in public spaces. He has not been sympathetic to death penalty defendants and has endorsed Second Amendment rights. He’s also written a book that, according to its publisher, “builds a … powerful moral and legal argument against legalization” of assisted suicide and euthanasia, based on “the idea that human life is intrinsically valuable.” Some have used that argument as a window into his future views in abortion cases. The empirics aren’t perfect, and Supreme Court nominees can surprise after they take their place on the bench. Former Justice David Souter, for example, was appointed by George H.W. Bush yet became reliably liberal. Kennedy, often considered the court’s moderate median, was appointed by Ronald Reagan. And while Gorsuch is the youngest nominee since Thomas, there is evidence that justices get more liberal as they get older — a trend not even Scalia was immune from. Still, for now, Gorsuch has pretty unimpeachable conservative credentials. He also has a sterling résumé. Those two qualities have historically been important in how easily the nominee navigates the Senate confirmation process — senators are more likely to vote “yea” on better qualified and more moderate nominees. One other thing to keep an eye on in the coming weeks that could also affect Gorsuch’s chances of making it to the bench: public opinion. Qualifications and ideology matter, but a nominee’s approval rating also has some predictive power. Robert Bork, for example, had a net approval rating of -11 percentage points at the time of his confirmation vote in 1987 and got far fewer votes than one would expect given his ideology and experience. Thomas was likely confirmed (albeit barely) despite the Anita Hill controversy, in part, because his net approval rating was +36 percentage points. The only nominee who would be predicted to get more than 60 votes with an approval rating equal to Trump’s would be Anthony Kennedy, who at the time of his nomination was seen as well-qualified and far more moderate than Gorsuch is. Compare that to a nominee with an average approval rating. All the previous nominees with the exception of Thomas, who was far, far less qualified than Gorsuch, would get about 60 “yea” votes or more in this situation. And given that there may be a few Democratic senators who vote “no” and still vote to end any filibuster, it’s likely that any nominee with an average approval rating will be confirmed. There is, of course, a margin of error with these estimates.